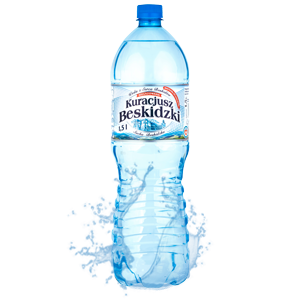 The still water Kuracjusz Beskidzki can be consumed in every amount in any frequency by persons in different age. This water is especially recommended to persons who don’t tolerate fizzy drinks. This water is also suggested in every day diet. 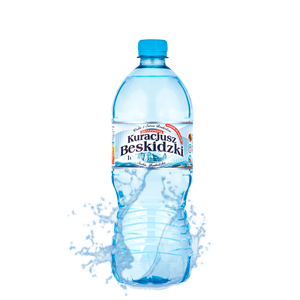 Still water Kuracjusz Beskidzki Sport is recommended for persons with active life style who don’t tolerate fizzy drinks. Still water Kuracjusz Beskidzki is provided in 5 litre bottles. It is a spring water with constant composition of minerale. 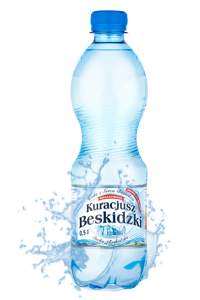 It is drawn directly from underground water intake of the spring called Kuracjusz on the slope ofr the mountain Jasień in Sucha Beskidzka, which guaranties its purity. This water is perfect for boiling dishes, making coffee or tea or preparing other drinks because it extracts flavour. This water is suggested for persons with active life style, who don’t tolerate fizzy drinks. Still water Kuracjusz Beskidzki is perfect for boiling dishes, making coffee or tea or preparing other drinks because it extracts its excellent flavour. 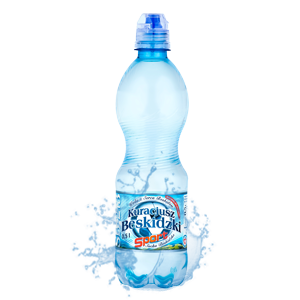 This water is suggested for persons with active life style, who do not like fizzy drinks. The bottle with a a perfect shape for the hand. It tastes excellent chilled to the temperature around 5o. It is suggested for persons who prefer stil drinks with mild taste.